Discussion in 'Bonus Spins - Extra Spins - No Deposit Bonuses' started by Marina, Jul 1, 2016.
Who scored the winning goal in the final for Spain in their succesful Euro 2008 campaign? No Wagering Requirements on free spins winnings at Guts Casino! Which of these teams failed to win a game during the group stages whilst acting as host nation for the European Championships? The Guts Casino Trivia runs until 9th July 2016, still a few free spins to win for correct answers. You should also check out the daily missions, you can get extra free spins, deposit match bonuses, extra points for the leaderboard and more. If you are an active, depositing players at LuckyDino Casino then keep an eye on your emails Tomorrow, July 4th 2016! Lucky Dino Casino is celebrating 2nd Birthday and will surprise loyal players with a free spins gift. In which Swedish stadium did the Euro 1992 final match take place? 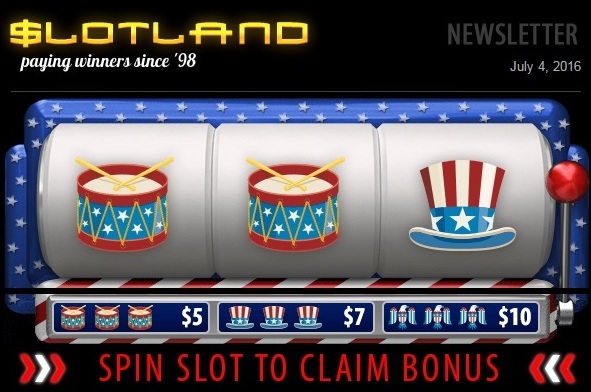 Slotland Casino has a free bonus for players to celebrate 4th of July - Independence Day! Just login to your Slotland account, Read the newsletter and spin the newsletter slot! You can get $5, $7 or $10 no deposit bonus! Valid from Monday, July 4th, 2016 12:01 AM EDT until Friday, July 8th, 2016 11:59 PM EDT. Which national squad was surprisingly knocked out by Russia in the second round of Euro 2008, after winning all 3 matches in the group stage with great dominance? Login to your LuckyDino Casino account, I received now free spins to celebrate their 2nd birthday! The free spins are in Theme Park: Tickets of Fortune Slot! Hope many of you have the freespins, good luck all! The first 2500 active players at Video Slots Casino get 10 Seasons slot Spins! Which legendary goalkeeper defended the Soviet goalposts during the USSR's winning 1960 European Championship campaign? I just got an email from Vera&John Casino! I've got 40 no deposit free spins on Piggy Riches Slot Game! Which English player hit the post in front of an empty goal at point-blank rage in extra time during the semi-finals against Germany, when the score was 1-1? Who was the youngest player ever thus far to play in a European Championship? Login to your Yako Casino and check in the NetEnt Slot Jack and the Beanstalk. Some players have free spins! A few active Cherry Casino Players have free spins in their account for Drive Multiplier Mayhem Slot or Mega Fortune! England’s best finish in the European Championships was? Who scored the first goal of the current Euro 2016 tournament? The final of the Euro 2016 is today and players can claim again halftime free spins via their mobile device in Betsson Casino. Claim 5 free spins on the slot Spin & Win beetween 21:45 and 22:00 CET! For active players from: Sweden, Norway, Finland, Germany, Austria, Switzerland, Iceland and the Netherlands. Have a look at Cherry Casino please. Some players have freespins at Drive Multiplayer Mayhem Slot.